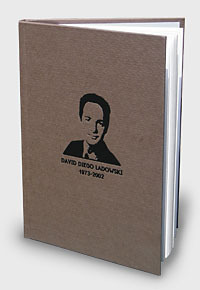 On July 31, 2002, David Diego Ladowski went to the Hebrew University of Jerusalem to deliver his last papers to complete his Masters Degree in Public Policy and was getting ready to assume his position as Vice-Consul at the Embassy of Lima, Peru in about a week. But that day, a bomb planted at the cafeteria by a terrorist group killed David Diego along with other 5 Americans and 3 Israelis and wounded 84 people. The David Diego Ladowski Memorial Fund was created to honor the memory of David Diego Ladowski and to continue his legacy. This extraordinary young man was born in 1973 in Buenos Aires, Argentina and immigrated to Israel in 1992. All by himself, he achieved what not many people can in a short period of time. David Diego was a special human being always caring for others. A humanist, pacifist with strong convictions but also very humble. Since then, the University of Jerusalem gives an annual award in David's honor that consists in merit scholarships. At the initiative of the Ladowski family it was established amerit scholarship award that is given to gifted and talented young students, committed to a lifetime of public service and working for world peace and excellence. The David Diego Ladowski Memorial Fund provides financial help for students at the Hebrew University of Jerusalem. On July 31, we’ll remember 15 years since the attack at the Hebrew University, for which the David Diego Ladowski Memorial Fund undertook a fundraising campaign to expand contributions in memory of David Diego Ladowski. On this website, there are some articles published about him, photos, and speeches that describe more of this incredible and talented man’s life. Israel's Ministry of Foreign Affairs.